• In 2016 in Bucharest the total land area transacted was of 110 ha, the highest volume recorded in the last ten years. In terms of value, land transactions amounted € 127 mil., which represents an increase of 41% compared with the previous year. The largest sites were acquired by foreign investors. • The most expensive lands were acquired for office development in the central area of the city, while at the opposite stand the logistics sites located on A1 Highway. With transaction prices range between 20 €/sq. m and 1,800 €/sq. m, the average price was of 115 €/sq. 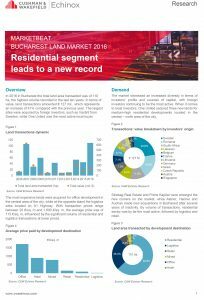 m, influenced by the significant volume of residential and logistics transactions at lower prices.